We gonna have Mojito’s!! The non alcoholic kind… It is Monday after all! Roll with me on this one, Monday morning and you need a wake me up. Today is the day most people go back to work, oh no! Yes, Christmas and New Year’s is well and truly over, sad face. I have the best thing to pick you up this morning, a refreshing and energising virgin kombucha mojito! YAY! Party in the house, *raising the roof*. Let me explain, this mojito is non alcoholic and absolutely delicious. I had my first mojito the other night during a yummy thai dinner, yes that’s right, my first ever mojito! I don’t know where I have been, living under a rock probably! No no, I’m always into the piña colada’s, Midori’s and my favourite, Moscato! But then again, I rarely drink, only on the occasional dinner or cruise ship! Although this kombucha mojito doesn’t have a sugar syrup or rum, I think it still tastes pretty close to the original, thanks to the sweet, tart and slightly bitter kombucha. 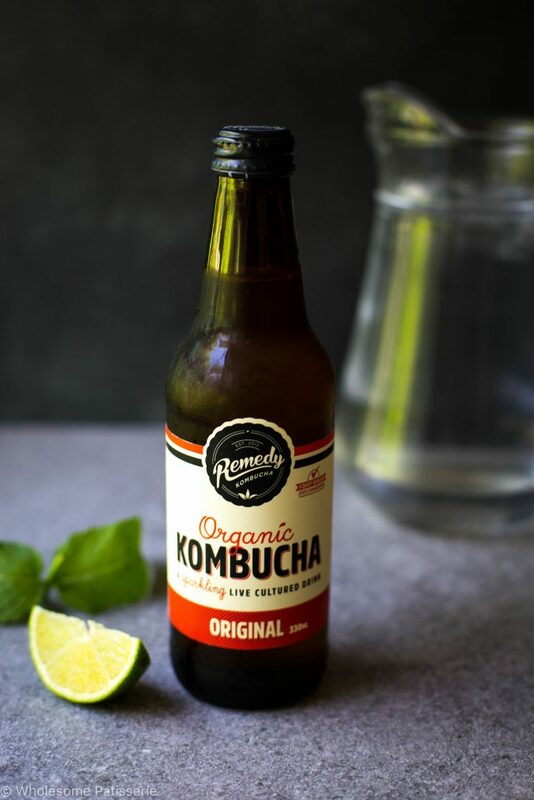 You can pick kombucha up from your local health food store, thats where I get mine! My current favourite though is from an Australian company called Remedy Kombucha, so if you live in Australia, try it! 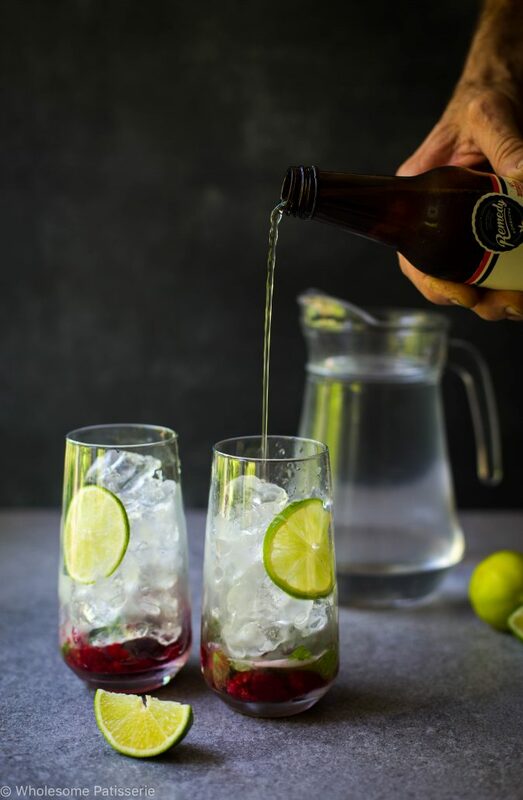 So kick start your Monday on the right side of the bed, where you bed side table is, where you can rest your delicious kombucha mojito mocktail! To the bottom of each glass (serves 2 glasses) slightly squeeze 3-4 lime wedges, then place wedges into the glasses. Then add raspberries, 2 tablespoons in each glass and desired amount of mint leaves. 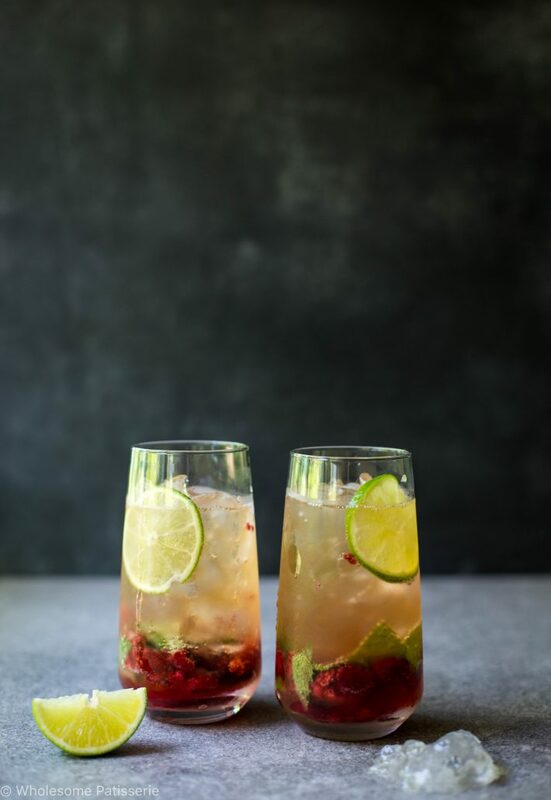 Using a muddler or the end of a wooden spoon, muddle (squish) lime, raspberries and mint together until the raspberries juices are released. Fill each glass half way up with ice. 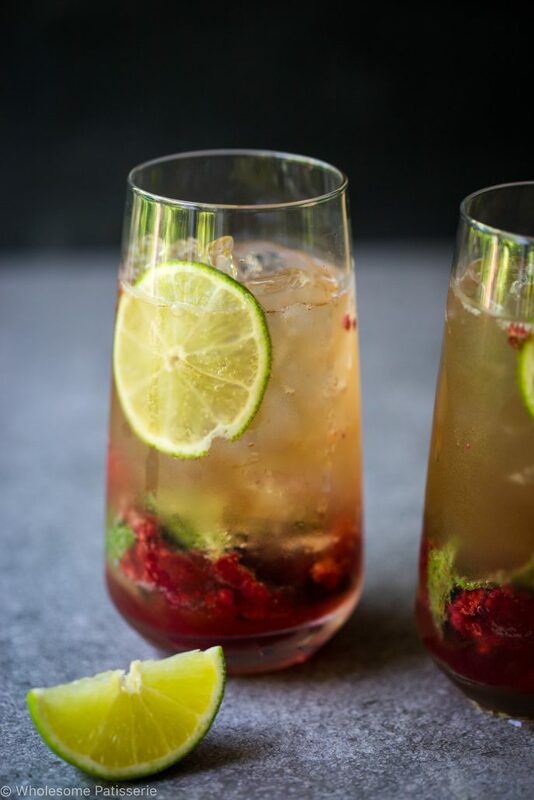 Pour kombucha over ice, stir a little to combine with the raspberries, lime and mint.